[UPDATE] Enterprise Tag Manager Vendor Comparison: Which TMS Should You Choose? This blog post was originally published on October 17, 2016. We invite you to read the new version of our Enterprise Tag Manager Vendor comparison. It’s even more detailed than the previous one and includes more products! There are some tag management systems which pride themselves on being an enterprise tag manager. They give you a list of some functionalities, services, and nice pictures, but you may still be wondering what makes them different from non-enterprise tag managers. In this blog post, we’d like to show you what actually makes a tag manager an enterprise-ready solution. Then we’ll proceed to a comparison of enterprise tag manager vendors. Based on that information you should be able to determine which platform is the most suitable for you and your organization. Why do you need a tag manager in the first place? Sometimes the development team may need weeks or even months for a development cycle. This is unacceptable if you need to track something or implement a campaign in short order. Tag managers make it easy to manage tags on your properties without engaging the IT department. Customer Support – Enterprise solutions offer advanced support, a dedicated account manager, technical and user training, and much more. You don’t have to look all over the Internet for advice when you run into a problem. Privacy and Data Ownership – Every enterprise-grade organization struggles to keep track of the mountain of regulations around the world. You risk costly fines and damage to your company’s reputation – no serious business can let this happen. Your tag manager should provide you with privacy features and full control over your data. Tag Support and Scalability – An enterprise solution offers a wide range of integrations and is flexible enough to allow custom integration with third-party tools. It should support all digital marketing technologies. Adjusted for Mobile – We hear a lot about the mobile era. This is still “the big thing”, so your tag manager needs to support mobile apps and technologies. Each operating system requires its own set of development libraries, but free TMSs give you very limited mobile support. Let’s have a look at the major players in the enterprise tag management field. Google introduced its own TMS back in 2012. It is the most frequently chosen solution and has captured almost 92% of the market. It allows its users to rapidly test and deploy new tags, as well as maintain existing tags and implement new ones. GTM is so popular among website owners because of its freemium model, clear interface, and the fact it works great with Google Analytics (which is presently the most popular web analytics software available). It offers range of inbuilt tag templates, debug mode, as well as service of synchronous and asynchronous tags. GTM collects data about your tags, which may give rise to privacy and security concerns for enterprises and other organizations handling sensitive data, especially in the face of GDPR. It also does not support the use of synchronous tags. Available in Cloud and On-Premises versions, Piwik PRO Tag Manager is offered with integrated privacy features. It allows users to quickly and efficiently deploy, modify and manage tags across a range of sites and applications with minimal technical expertise. In addition to standout features, Piwik PRO Tag Manager has been designed with a wide range of other easy-to-use features. As a part of the Piwik PRO web analytics suite, it can be easily integrated with Cloud and On-premises analytics. Preset templates make it easy to implement a range of actions including content tracking, event tracking, custom dimensions and variables. There is an Opt-out/Do Not Track option available at the individual tag level to make sure all tags are privacy compliant regardless of the tool they come from. Moreover, Piwik PRO offers debug mode in both desktop and mobile versions. Piwik PRO Tag Manager has quite a small library of built-in templates and triggers, especially compared to Google Tag Manager. Also, the tool doesn’t provide you with a way to duplicate your own tags. Fortunately, it’s all about to change with the next version of PP TMS. This tool was established in 2008 in the USA as one of the first enterprise tag managers. In 2014, it was announced in Inc. 500’s as one of the country’s fastest-growing private companies. Hundreds of top brands worldwide rely on Tealium to seamlessly manage their digital marketing deployments. Organizations using Tealium can improve their ROI by boosting the performance of their existing marketing programs, improving marketing efficiency and reducing IT friction and costs. The company has also introduced two other products to its cloud – AudienceStream and DataAccess. Tealium, just like Piwik PRO, provides its customers with opt-out choices and supports Do Not Track preferences. It retains the trust of customers due to its rapid growth over the past few years coupled with high quality of services and support. Its integration ecosystem includes almost 1000 digital vendors. Pricing of Tealium is significantly higher than in other solutions like Piwik PRO. However, Tealium seems to have some usability issues. It is much less intuitive than other tools and is considerably more complex and hard to learn compared to GTM and Piwik PRO. Segment, based in San Francisco, California, is a provider of customer data infrastructure. The company was founded in 2011 and released its first product a year later. Their product, while not a typical tag management tool, is promoted as a highly integrable alternative to TMSs. Segment’s main advantage is the ability to integrate with virtually every marketing, advertising, email, analytics tool available on the market. It can also transform and load multiple data sources into the warehouse, which is a great convenience. As we’ve said before—Segment is not a real tag management system and can’t be treated as a replacement for this kind of tools, at least for now. The product provides virtually no built-in triggers and conditions, and offers very limited testing and debugging options. Dynamic Tag Manager offered by Adobe is available to every customer of Adobe Marketing Cloud for free. It was created to manage tags and data distribution on your web properties. It allows you to manage tags across all of your sites regardless of the number of them. The User Interface is robust and easy to navigate. If you work with other Adobe products, DTM manages those tags extremely well. Ensighten serves tags dynamically, as visitors interact with your website, enabling easy personalization. It provides its users with full control over the deployment and optimization of marketing technologies. It works on any device and platform – desktop, mobile, video and more. It is adjusted for collaborative environments requiring technical flexibility and high availability. It does not support Opt-Out and Do Not Track features. Ensighten is available exclusively as a SaaS deployment. Thus it is not recommended for data-sensitive industries. It lacks many popular triggers and conditions present in other tools like Piwik PRO TM and GTM. Hungry for more details? You can learn more about functionalities of the most popular tag management systems from our freshly updated comparison. 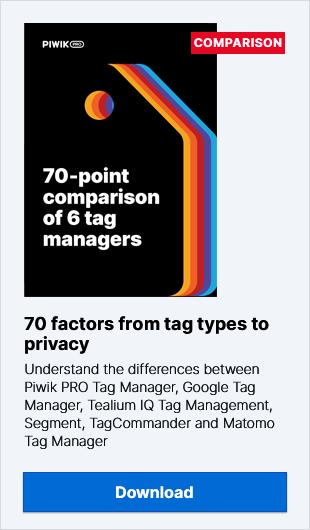 Get to know the 40 key differences between Google Tag Manager, Segment, Tealium, Adobe Marketing Cloud, Ensighten & Piwik PRO.